Your feathered friends will thank you for taking care of them with our charming gnome bird feeder. Aside from having a delightful cheery gnome dressed in red and green on your patio, you'll be visited by some pretty, happily chirping, grateful birds. Our garden gnome bird feeders are ready for the winter, as they're made from weather-resistant cast stone resin. The size, 9 inches by 9 inches by 16.5 inches, is ideal for even a smaller deck or patio, so you and your family can enjoy watching birds as they partake of seeds from a large leaf. 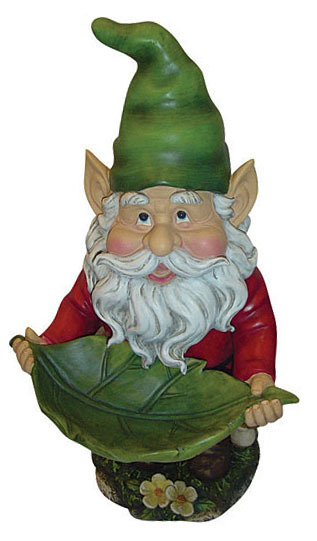 At GardenFun, we have unique bird feeders, garden gnomes, and other yard decor, so you can experiment with various fun and fanciful scenes in your outdoor environment.